Argon (Ar) is a noble gas discovered in 1894. Ar is a colorless, tasteless, odorless, noncorrosive, noninflammable, and nontoxic gas. It is the most abundant noble gas, and the third major component of the air, with a concentration of 0.93%. Ar's density is 38% higher than air, and the solubility in water and plasma is 24-fold lower than that of carbon dioxide (CO2). Ar has a full electron valence shell which avoids covalent binding with other elements; therefore, it is usually considered a nonreactive chemical gas, as known by its Greek name “αργός,” meaning “inert.” Although labeled as a “biologically” inert gas, recent evidence suggest that the drug can have significant effects. Narcotic effects have been described in divers since 1939 and further confirmed by other studies.,,,,, Besides narcosis, evidence of neuroprotection has been rising since the first report in a rodent model of hypoxic brain injury, in 1998. In more recent years, the protective effects of Ar after ischemia became more evident preclinically. The aim of this work was to review all the preclinical studies employing Ar, both in vivo and in vitro, focused on organ protection, and its clinical uses. A concurrent PubMed and Embase search was carried out and updated till October 2017. “Ar” was used as MeSh and Emtree term for PubMed and Embase search, respectively. The following keywords were then used to narrow and focus the search: “neuroprotection,” “cardioprotection,” “organ protection,” “cellular protection,” “organ transplantation,” “ischemia -reperfusion injury,” “hypoxic-ischemic injury,” “perinatal asphyxia,” “cardiac arrest (CA),” “traumatic brain injury,” “pneumoperitoneum,” “lung volume measurement,” “cardiac output measurement,” “narcosis,” “diving,” and “hyperbarism.” During the selection, only English-written articles with full text available were considered. Both in vitro and in vivo studies and human application of Ar were included in this review. Articles concerning the surgical use of Ar, i.e., “Ar laser,” “Ar beam,” and “Ar coagulation” were excluded. Articles selection was performed independently by two authors (FN, SR). Fifty-five pertinent articles were found and included. Original results from a study performed by our group on a rat model of acute myocardial infarction (MI) were added. Forty-four preclinical studies were found.,,,,,,,,,,,,,,,,,,,,,,,,,,,,,,,,,,,,,,,,, The majority (n = 25) of in vitro and in vivo studies with Ar focused on neuroprotection after a variety of brain damages,,,,,,,,,,,,,,,,,,,,,,,, in which different neurological and behavioral tests were combined with histological and biochemical assays. Four studies evaluated the presence of cardioprotective effect after myocardial ischemia/reperfusion (I/R).,,, Nine studies focused on the preservation of other organs and tissues, such as ex vivo perfused kidney and lung, and culture of human airway epithelium, kidney tubular, and osteosarcoma cells.,,,,,,,, A single study evaluated the influence of Ar inhalation on liver regeneration after partial hepatectomy. Three in vivo studies investigated the effects and the mechanisms of action of Ar under hyperbaric condition.,, Five studies specifically focused on the safety: In 2, Ar was administered as respiratory mixture to pigs;, while, in 3 studies, Ar was used to induce pneumoperitoneum for surgical laparoscopic procedures in place of CO2.,, The area of interest is summarized in [Figure 1]a. Overall, both in vitro and in vivo studies provided evidence in support of a protective role of Ar, independently from the disease model and the duration and onset of exposure to the treatment (i.e., pre- or post-acute event) [Figure 1]b.
Seventeen articles investigated the protective effects of Ar on cell damage [Table 1].,,,,,,,,,,,,,,,, In details, two studies were performed in rodent cardiomyocytes, and one of these included also additional investigations in human right atrial appendages obtained from patients undergoing coronary artery bypass or valve replacement surgery;, 9 in rat neurons or hippocampal slices;,,,,,,,, 5 in human cells (neuroblastoma, kidney, airway epithelium, osteosarcoma);,,,, and one in whole blood from rodents. One in vitro study investigated whether Ar interacted with tissue plasminogen activator (tPA). The duration of the imposed insult varied from 30 min of hypoxia in cardiomyocytes, to several hours under oxygen (O2) glucose deprivation condition, up to 30 h in the drug-induced toxicity studies. Overall, the in vitro studies showed improved cell survival and viability when Ar was used both pre and after the insult. More specifically, Ar reduced apoptosis in neuronal, tubular kidney, and airway epithelial cells.,, As for cardioprotection after I/R, besides increasing cell viability, Ar also diminished early depolarizations in the ventricle tissue, limiting the onset of ischemia-triggered arrhythmias. When Ar was applied on the human right atrial appendages after hypoxia/reoxygenation injury, the recovery of contractile activity was increased. Ar blocked the tPA thrombolytic effects at low concentration (25%), while the tPA catalytic and thrombolytic efficacy was increased at concentrations above 50%. Thus, it was suggested that in the context of ischemic stroke, Ar 75% could be given during ischemia to favor thrombolysis, but not after reperfusion. Twenty-four studies employed Ar as a potential protective treatment for brain, heart, and other organ preservation after different ischemic insults.,,,,,,,,,,,,,,,,,,,,,,, Six studies used swine models,,,,, and 18 rodent ones, including rats, guinea-pigs, and rabbits.,,,,,,,,,,,,,,,,, In addition, three studies investigated the effects of Ar under hyperbaric conditions.,, A single study evaluated the effects on the initiation of liver regeneration in rats. 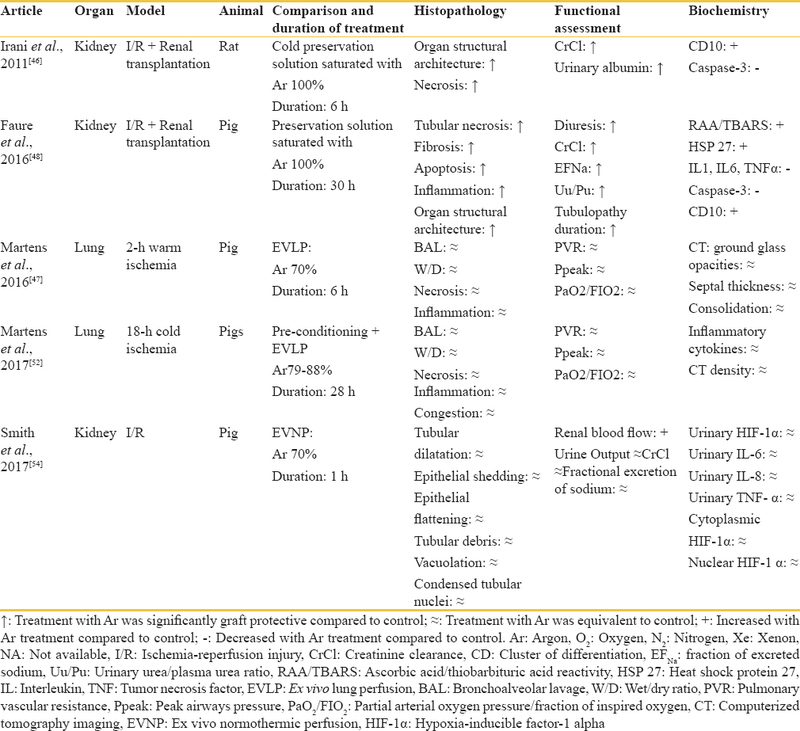 These studies reproduced the following human conditions: ischemic stroke, neonatal hypoxic-ischemic encephalopathy (HIE), subarachnoid hemorrhage, MI; CA, organ (kidney and lung) transplantation, exposure to hyperbaric condition, and liver surgery [Table 2], [Table 3], [Table 4]. Regarding the use of Ar as neuroprotective agent, only 4 studies,,, evaluated the postinsult neurological recovery, and in half of them, there was evidence for a better outcome after Ar inhalation when compared to the control. All the investigations, except one focusing on the safety of Ar, included histological evaluations, in different brain areas. Overall, there was evidence for a mitigation of the brain tissue injury. In one study on a rat model of middle cerebral artery occlusion, Ar had contrasting effects, with a reduced infarct size in the cortical area, but an increased injury in the subcortical area, compared to sham animals. However, in this study, animals treated with Ar had a significantly higher body temperature (average of 38.5°C), which could explain the greater brain damage compared to the controls. In studies focused selectively on I/R injury in the retina, Ar confirmed its protective effects in a dose- and time-dependent manner [Table 2]. In a model of perinatal HIE, Ar inhalation had no effect on heart rate, arterial blood pressure and blood gases, cerebral O2 saturation, and electrocortical brain activity. Studies focused on neurological injury following resuscitation from CA are described in a dedicated section of this review. Regarding the use of Ar as cardioprotective treatment, 3 studies were individuated,,, one of which investigated the cardioprotection within the broader post-CA syndrome. Overall, the studies provided evidence for a reduced infarct size and an improved left ventricle systolic function, evaluated either by echocardiography or magnetic resonance [Table 2]. Additional data come from a preliminary study in a rat model of myocardial I/R injury recently performed by our group (published in this review as original data). The left anterior descending was occluded for 30 min, and animals were randomized to receive 1-h ventilation with Ar 70% versus N2 70% in O2, starting 5 min before reperfusion. One hour after reperfusion, rats were weaned from mechanical ventilation and returned to their cages. Six h after reperfusion plasma samples were collected for high-sensitive cardiac troponin T (hs-cTnT) assay and animals were sacrificed. Myocardial infarct size was assessed by tetrazolium chloride staining, and inflammatory response was evaluated in terms of neutrophil infiltration by naphthol staining. Rats treated with Ar showed a lower plasma level of hs-cTnT compared to controls (median [interquartile range]: 3128 ng/L [1832–7053] vs. 7432 ng/L [4965–10000]; P < 0.05) together with a trend toward a reduction in neutrophil infiltration (mean ± Standard error of mean: 77 ± 7 cells/mm2 vs. 92 ± 8.5 cells/mm2; P = not significant). Nevertheless, there was no reduction in infarct size. Ar showed narcotic effects only under hyperbaric conditions., Different theories have been proposed to explain this property. Most likely, the increase of the inert gas pressure induces modification on cytoplasmic membrane and/or receptor condition, subsequently modifying the neurotransmission. Indeed, when rats were exposed to Ar at ≈ 19 atm for 2 h, dopamine release from striatum decreased by approximately 10% compared to animals that were not exposed to the gas. Since the striatum coordinates different aspects of motor planning and motivation, a subsequent study investigated the relationship between motor activity and dopamine release in rats exposed to Ar in a pressurized chamber for 100 min. During the compression period, a transient phase of hyperactivity was observed, followed by a decrease in the motor activity. More specifically, exposure to Ar at the pressure of ≈ 10 atm, showed motor hyperactivity, probably related both to the higher pressure and to the narcotic potency of the gas, dependent on its lipid solubility. When the pressure was raised to ≈ 20 atm, loss of righting reflex was observed, indicating the onset of the anesthetic effect. This subsequent decrease of behavioral activity could be ascribed to the decrease of dopamine release from the striatum that occurred when the 20 atm pressure was achieved and was kept constant for at least 10 min. Another study concerning Ar anesthetic properties analyzed the contribution of gamma-aminobutyric acid (GABA) transmission as a possible mechanism of action for narcosis. Rats were treated with different GABA receptor antagonists (gabazine and flumazenil, as GABAA antagonists, and 2-idrossisaclofene, as GABAB antagonist) and then exposed to Ar in a pressurized chamber. Pretreatment with GABAA inhibitors increased significantly the Ar threshold pressure for the loss of righting reflex. Instead, pretreatment with GABAB inhibitor showed no significant effects on narcosis [Table 2]. Regarding the use of Ar for organ preservation, kidneys and lungs were the preferred targets.,,,, Indeed, reduced acute tubular necrosis and inflammatory lesions accompanied by better renal function and faster recovery were observed after heterotopic autotransplantation in which the removed kidney was preserved in a cold storage solution saturated with pure Ar., Smith et al. studied the effects of ex vivo normothermic perfusion with a gas composition of 70% Ar for 1 h, in a porcine model of kidney ischemia-reperfusion injury. The authors did not observe any organoprotective effect as far as hemodynamics, renal function, functional parameters, inflammatory markers, and histological analysis were concerned. In EVLP following a period of warm ischemic injury in the swine, 6-h ventilation with a respiratory mixture containing 70% Ar in O2, did not show any benefit in graft function. Indeed, no significant differences in ventilator parameters, such as pulmonary vascular resistance, peak airway pressure, and blood gases, nor in the histopathology, were observed, compared to a control ventilation with N2/O2. In 2017, the same group confirmed the above results in a model of cold I/R injury during EVLP. Overall lungs were exposed to Ar at a different concentration ranging from 79% to 88% in O2 for 28 h. At the end of the exposure, no beneficial effects on graft quality were observed [Table 3]. The use of Ar ventilation for neuroprotection after CA was explored in 6 studies,,,,,, [Table 4]. All these studies reported both neurological recovery, evaluated with various neurobehavioral tests, and tissue damage, assessed by histopathology and biochemistry. Of the 5 studies using the rat model of CA, 4 were from the same research group,,, that investigated the effect of 1 h of ventilation with a mixture of 70% Ar in O2 initiated 1 h after resuscitation. After a no-flow of 7 min, postresuscitation ventilation with Ar led to a better and faster neurological recovery during the following 7 days compared to the control ventilation. The results were assessed by a battery of tests, including the rodent neurological deficit score, the open field, and the Morris water maze tests. This good functional recovery was paralleled by a significantly lower brain damage in the neocortex and the hippocampal CA 3 and 4 regions. In a subsequent study employing the same model of CA and cardiopulmonary resuscitation, it was confirmed that such beneficial effects of Ar treatment were dose-dependent. Indeed, both the neurological outcome and the histopathological brain damage were confirmed to be improved compared to controls, after exposure to Ar at a concentration of either 40% or 70% after resuscitation; however, the neuroprotective effects were significantly more pronounced when the inhalatory mixture contained 70% Ar in place of 40%. A third study introduced further data showing that the 70% Ar-induced neuroprotection persisted even when the onset of the treatment was delayed up to 3 h after resuscitation. More recently, neuroprotection of Ar was investigated in conjunction with mild therapeutic hypothermia (MTH), based on the hypothesis that the combination of these 2 interventions could boost protection, further improving neurological outcome after CA. Thus, in the same model, rats were treated with MTH at 33°C (6 h) and 1 h ventilation with 70% Ar. Surprisingly, the results showed that the combined treatment, similarly to a control ventilation with air/O2, generated worse neurological recovery together with greater neuronal degeneration in hippocampal CA1 region when compared to MTH alone. Unfortunately, in this study the treatment with Ar alone, as a reference, was absent and thus no further considerations on the effect of Ar could be made. In a model of CA with an underlying acute MI in swine, a 4-h ventilation with a mixture of 70% Ar–30% O2 initiated immediately after resuscitation was compared to a control ventilation with an equivalent percentage of N2/O2. This study confirmed the Ar-induced neuroprotective effects previously shown in rats. More specifically, animals that received Ar achieved a faster and more complete neurological recovery, already 24 h after CA, in contrast to controls, in which a neurological impairment persisted up to 72 h after resuscitation. The improvement in neurological recovery was confirmed by different neurological tests and by the circulating level of serum neuron-specific enolase, a biomarker of neuronal damage. Histopathology supported this benefit on neurological recovery, showing lesser brain injury in animals that were treated with Ar compared to controls. In addition, a trend toward a smaller myocardial infarct size was also observed after inhalation of Ar. The same group has recently replicated these results showing a beneficial effects of Ar ventilation on neuro- and cardioprotection in a more severe model of CA (abstract only available). In a model of CA in rodents induced with KCl and esmolol, 24-h ventilation with a mixture of 50% Ar-50% O2 was conducted, starting 15 min after resuscitation. As the primary outcome, neuronal damage was assessed by histopathology, while as secondary outcome, neurologic tests were performed. A trend toward a lesser neuronal damage after Ar treatment was reported. The description of the potential mechanisms of action involved in the Ar protection derives mainly fromin vitro studies and have been further confirmed in vivo. Ar appeared to possess O2-like properties, which could explain its neuroprotective effects by partially restoring mitochondrial respiratory enzyme activity and reducing N-methyl-D-aspartic acid-induced neuronal death. Moreover, Ar plays anti-apoptotic effects modulating the molecular pathways involved in cell survival. In details, it increases extracellular signal-regulated kinase (ERK) 1/2 phosphorylation, already after 30 min of exposure; it blocks the apoptosis cascade;,, it upregulates the expression of the anti-apoptotic protein B-cell lymphoma-2;, it activates the toll-like receptor 2 and 4, which reduce caspase-3 activity,, and mediate the intracellular signaling involved in the production of pro-inflammatory cytokines, growth factors, and cell survival [Table 1]. Two studies aimed to specifically evaluate the safety of Ar ventilation in pigs., In 1 study, a 6-h ventilation with Ar 79% in pigs showed no toxic effects, as demonstrated by serum biomarkers and assessment of liver and kidney function and structure. In the other study, neonatal piglets were ventilated with Ar at different concentrations, ranging from 30% to 80% in O2, for a total of 3 h. Effects on hemodynamics and blood gases were evaluated, and prolonged ventilation with Ar was confirmed to be safe at each concentration. A similar study observed an augmented hypothermic protection at 48 h after hypoxia-ischemia with Ar from 2 to 26 h, shown by improved brain energy metabolism, faster electrical brain activity recovery and reduced cell death. In 3 studies, Ar was used as a substitute of CO2 in inducing pneumoperitoneum during laparoscopic surgery to evaluate its safety profile.,, Ar insufflation into the abdominal cavity produced hemodynamic modifications, mainly related to increases in abdominal pressure and perhaps to a potential effect on systemic vascular resistances (effect observed in 1 study but not replicated in the other). No significant changes in respiratory functions were observed. Since Ar is lesser soluble than CO2, an increased risk of hemodynamic instability exits in the instance of accidental gas embolism. Finally, because Ar is denser than air, it could be argued that ventilation with such a gas could increase respiratory resistance. However, none of the preclinical studies reported such a condition after prolonged exposure to Ar. Moreover, a study with a model of vigorous ventilation in a respiratory resistance machine showed no changes in respiratory resistance at atmospheric pressure, and up to 4 atm, when Ar 80% was compared to air. Since the sixties, Ar was applied for the measurement of lung volumes,,, with the rebreathing/gas-dilution technique. Ar 6%–7% has been also used to calculate the cardiac output CO., and for the estimation of global myocardial blood flow. In these studies, subjects were exposed to a single or a few breaths of an isobaric mixture of Ar and no conclusions on safety issues may be extrapolated. The feasibility of Ar use was addressed by studies involving divers. In these studies, divers breathed Ar mixtures for long periods in hyperbaric conditions. In 1939, motor and cognitive impairment, such as slowed mental activity, inability to perform efficient manual work and emotional disturbances, which might lead to loss of consciousness, were described in divers breathing a mixture of 69% Ar, 20% O2 and 11% N2 from 1 to 10 atm. In another study, 10 subjects performed mental arithmetic tasks while exposed to Ar 80% in O2 at 1, 4, and 7 atm. Again, Ar under hyperbaric condition showed more narcotic effects. The longest exposure to Ar under hyperbaric condition was in 1998. Four male volunteers participated in a simulated diving at 10 m for 7 days with following gas mixture: O2 0.2 ± 0.005 kg/cm2, N2 0.8 ± 0.01 kg/cm2 and Ar 1.0 ± 0.01 kg/cm2. No effects on central nervous system electrophysiology and functional test, cardiopulmonary system, i.e., electrocardiogram, oxihemometry, and biochemical analysis of urine, were detected. All measured data did not exceed physiological range. Under hyperbaric pressure, a workload of 100 Wt was performed 62% higher when breathing Ar 15% in O2 than N215% in O2. Moreover, the exposure to a hypoxic Ar-N2 mixture containing O2 0.15 ± 0.005 kg/cm2, instead of O2 0.2 ± 0.005 kg/cm2, determined an increase in the performed work volume, showing that Ar causes a positive effect on organism adaptation to hypoxia. Another study performed on 8 human volunteers investigated the possible adverse effects from breathing isobaric mixture of 80% Ar and 20% O2 for 30 min. The authors did not observe narcosis nor coagulation nor fibrinolysis abnormalities, which would have been present in case of gas embolism. More recently, Ar inhalation has been proposed to measure the global cerebral blood flow (CBF), by a modification of the Kety-Schmidt technique. To establish this new method, 30 anesthetized patients undergoing cardiovascular surgery were subjected to ventilation with 70% Ar in O2 for 15 min, before the surgical procedure and CBF was evaluated. Ar ventilation did not show any influence on cerebrovascular circulation or metabolism, evaluated by transcranial Doppler sonography nor difference in content between arterial and jugular-venous lactate, glucose, and O2, respectively. Ar might diminish the neurological and myocardial damage after a hypoxic-ischemic insult. Indeed, Ar has been tested in different models of ischemic insult, at concentrations ranging from 20% up to 80%. Overall, Ar emerged as a protective agent on cells, tissues, and organs, showing less cell death, reduced infarct size and faster functional recovery. More specifically, encouraging data has been reported in animal studies on CA in which a better and faster neurological recovery was achieved when Ar was used in the postresuscitation ventilation. More importantly, these benefits have been replicated in different studies, enrolling both small and large animals. Ventilation with Ar in O2 has been demonstrated to be safe both in animals and humans. Based on all the evidence described in this article, the protective effects of Ar should be evaluated in a clinical scenario, in particular, those concerning the neuroprotective properties after CA which are strongly supported by preclinical evidence. Finally, Ar can be simply administered through a ventilator which is modified to be compatible with the gas mixture Ar/O2/air, in variable proportions, provided in dedicated cylinders. Indeed, Ar has a relatively low cost, approximately 9 Euro cent per liter, 10-fold lower than anesthesia agents such as sevoflurane and isoflurane and 100-fold lower than xenon. Ar use has been described in a variety of preclinical and human studies. Inhalatory Ar seems to be potentially beneficial in the context of organ protection after different types of insults. Safety data show nontoxic effects. Thus, preclinical and clinical data support future clinical studies on the inhalatory Ar therapy. Rayleigh L, Sec RS, Ramsay W. Argon, a new constituent of the atmosphere. Proc R Soc Lond 1895;57:340-6. Material Safety Data Sheet Gaseous Argon, Universal Industrial Gases, Inc. Available from: http://www.uigi.com/MSDS_gaseous_Ar.html. [Last retrieved on 2013 Oct 14]. Roberts MW, Mathiesen KA, Ho HS, Wolfe BM. Cardiopulmonary responses to intravenous infusion of soluble and relatively insoluble gases. Surg Endosc 1997;11:341-6. Ulbrich F, Goebel U. The molecular pathway of argon-mediated neuroprotection. Int J Mol Sci 2016;17. pii: E1816. Behnke AR, Yorarbrough OD. Respiratory resistance, oil-water solubility and mental effects of argon compared with helium and nitrogen. Am J Physiol 1939;126:409-15. Taylor JW, Hander EW, Skreen R, Wilmore DW. The effect of central nervous system narcosis on the sympathetic response to stress. J Surg Res 1976;20:313-20. Sauter JF. Electrophysiological activity of a mammalian sympathetic ganglion under hydrostatic and inert gas pressure. Neuropharmacology 1979;18:77-81. Smith CR, Spiess BD. The two faces of eve: Gaseous anaesthesia and inert gas narcosis. Diving Hyperb Med 2010;40:68-77. Rostain JC, Lavoute C, Risso JJ, Vallée N, Weiss M. A review of recent neurochemical data on inert gas narcosis. Undersea Hyperb Med 2011;38:49-59. Clark JE. Moving in extreme environments: Inert gas narcosis and underwater activities. Extrem Physiol Med 2015;4:1. Soldatov PE, D'iachenko AI, Pavlov BN, Fedotov AP, Chuguev AP. Survival of laboratory animals in argon-containing hypoxic gaseous environments. Aviakosm Ekolog Med 1998;32:33-7. Brücken A, Kurnaz P, Bleilevens C, Derwall M, Weis J, Nolte K, et al. Dose dependent neuroprotection of the noble gas argon after cardiac arrest in rats is not mediated by K(ATP)-channel opening. Resuscitation 2014;85:826-32. Brücken A, Cizen A, Fera C, Meinhardt A, Weis J, Nolte K, et al. Argon reduces neurohistopathological damage and preserves functional recovery after cardiac arrest in rats. Br J Anaesth 2013;110 Suppl 1:i106-12. Zuercher P, Springe D, Grandgirard D, Leib SL, Grossholz M, Jakob S, et al. Arandomized trial of the effects of the noble gases helium and argon on neuroprotection in a rodent cardiac arrest model. BMC Neurol 2016;16:43. Lemoine S, Blanchart K, Souplis M, Lemaitre A, Legallois D, Coulbault L, et al. Argon exposure induces postconditioning in myocardial ischemia-reperfusion. J Cardiovasc Pharmacol Ther 2017;22:564-73. Mayer B, Soppert J, Kraemer S, Schemmel S, Beckers C, Bleilevens C, et al. Argon induces protective effects in cardiomyocytes during the second window of preconditioning. Int J Mol Sci 2016;17. pii: E1159. Hafner C, Qi H, Soto-Gonzalez L, Doerr K, Ullrich R, Tretter EV, et al. Argon preconditioning protects airway epithelial cells against hydrogen peroxide-induced oxidative stress. Eur Surg Res 2016;57:252-62. Ulbrich F, Kaufmann K, Roesslein M, Wellner F, Auwärter V, Kempf J, et al. Argon mediates anti-apoptotic signaling and neuroprotection via inhibition of toll-like receptor 2 and 4. PLoS One 2015;10:e0143887. Rizvi M, Jawad N, Li Y, Vizcaychipi MP, Maze M, Ma D, et al. Effect of noble gases on oxygen and glucose deprived injury in human tubular kidney cells. Exp Biol Med (Maywood) 2010;235:886-91. Ulbrich F, Lerach T, Biermann J, Kaufmann KB, Lagreze WA, Buerkle H, et al. Argon mediates protection by interleukin-8 suppression via a TLR2/TLR4/STAT3/NF-κB pathway in a model of apoptosis in neuroblastoma cells in vitro and following ischemia-reperfusion injury in rat retina in vivo. J Neurochem 2016;138:859-73. Spaggiari S, Kepp O, Rello-Varona S, Chaba K, Adjemian S, Pype J, et al. Antiapoptotic activity of argon and xenon. Cell Cycle 2013;12:2636-42. Jawad N, Rizvi M, Gu J, Adeyi O, Tao G, Maze M, et al. Neuroprotection (and lack of neuroprotection) afforded by a series of noble gases in an in vitro model of neuronal injury. Neurosci Lett 2009;460:232-6. Loetscher PD, Rossaint J, Rossaint R, Weis J, Fries M, Fahlenkamp A, et al. 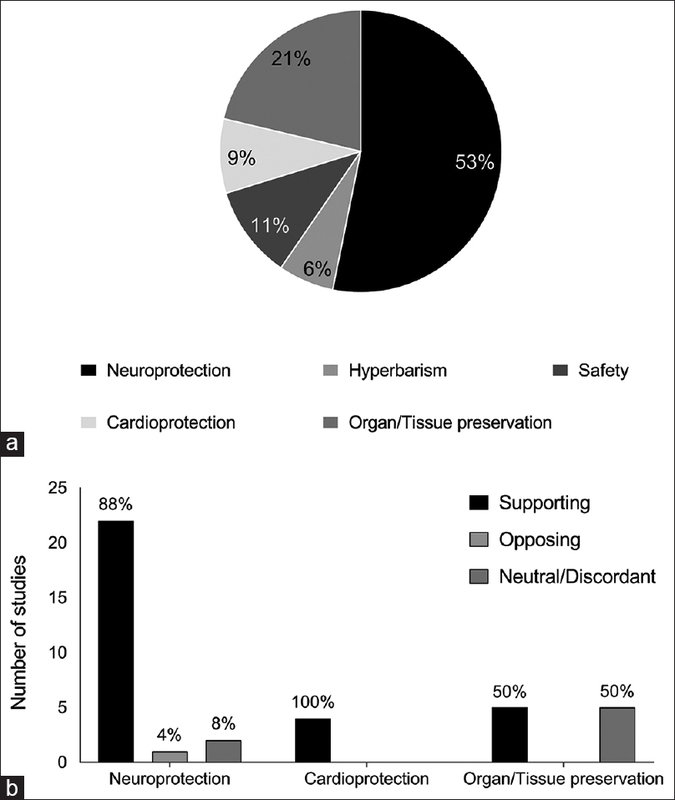 Argon: Neuroprotection in in vitro models of cerebral ischemia and traumatic brain injury. Crit Care 2009;13:R206. David HN, Haelewyn B, Degoulet M, Colomb DG Jr., Risso JJ, Abraini JH, et al. Ex vivo and in vivo neuroprotection induced by argon when given after an excitotoxic or ischemic insult. PLoS One 2012;7:e30934. Zhao H, Mitchell S, Koumpa S, Cui YT, Lian Q, Hagberg H, et al. Heme oxygenase-1 mediates neuroprotection conferred by argon in combination with hypothermia in neonatal hypoxia-ischemia brain injury. Anesthesiology 2016;125:180-92. Zhao H, Mitchell S, Ciechanowicz S, Savage S, Wang T, Ji X, et al. Argon protects against hypoxic-ischemic brain injury in neonatal rats through activation of nuclear factor (erythroid-derived 2)-like 2. Oncotarget 2016;7:25640-51. Harris K, Armstrong SP, Campos-Pires R, Kiru L, Franks NP, Dickinson R, et al. Neuroprotection against traumatic brain injury by xenon, but not argon, is mediated by inhibition at the N-methyl-D-aspartate receptor glycine site. Anesthesiology 2013;119:1137-48. Yarin YM, Amarjargal N, Fuchs J, Haupt H, Mazurek B, Morozova SV, et al. Argon protects hypoxia-, cisplatin- and gentamycin-exposed hair cells in the newborn rat's organ of corti. Hear Res 2005;201:1-9. Grüßer L, Blaumeiser-Debarry R, Krings M, Kremer B, Höllig A, Rossaint R, et al. Argon attenuates the emergence of secondary injury after traumatic brain injury within a 2-hour incubation period compared to desflurane: An in vitro study. Med Gas Res 2017;7:93-100. Höllig A, Weinandy A, Liu J, Clusmann H, Rossaint R, Coburn M, et al. Beneficial properties of argon after experimental subarachnoid hemorrhage: Early treatment reduces mortality and influences hippocampal protein expression. Crit Care Med 2016;44:e520-9. Alderliesten T, Favie LM, Neijzen RW, Auwärter V, Nijboer CH, Marges RE, et al. Neuroprotection by argon ventilation after perinatal asphyxia: A safety study in newborn piglets. PLoS One 2014;9:e113575. Ryang YM, Fahlenkamp AV, Rossaint R, Wesp D, Loetscher PD, Beyer C, et al. Neuroprotective effects of argon in an in vivo model of transient middle cerebral artery occlusion in rats. Crit Care Med 2011;39:1448-53. Fahlenkamp AV, Coburn M, de Prada A, Gereitzig N, Beyer C, Haase H, et al. Expression analysis following argon treatment in an in vivo model of transient middle cerebral artery occlusion in rats. Med Gas Res 2014;4:11. Ulbrich F, Schallner N, Coburn M, Loop T, Lagrèze WA, Biermann J, et al. Argon inhalation attenuates retinal apoptosis after ischemia/reperfusion injury in a time- and dose-dependent manner in rats. PLoS One 2014;9:e115984. Ulbrich F, Kaufmann KB, Coburn M, Lagrèze WA, Roesslein M, Biermann J, et al. Neuroprotective effects of argon are mediated via an ERK-1/2 dependent regulation of heme-oxygenase-1 in retinal ganglion cells. J Neurochem 2015;134:717-27. Balon N, Kriem B, Dousset E, Weiss M, Rostain JC. Opposing effects of narcotic gases and pressure on the striatal dopamine release in rats. Brain Res 2002;947:218-24. Balon N, Risso JJ, Blanc F, Rostain JC, Weiss M. Striatal dopamine release and biphasic pattern of locomotor and motor activity under gas narcosis. Life Sci 2003;72:2731-40. Pagel PS, Krolikowski JG, Shim YH, Venkatapuram S, Kersten JR, Weihrauch D, et al. Noble gases without anesthetic properties protect myocardium against infarction by activating prosurvival signaling kinases and inhibiting mitochondrial permeability transition in vivo. Anesth Analg 2007;105:562-9. Irani Y, Pype JL, Martin AR, Chong CF, Daniel L, Gaudart J, et al. Noble gas (argon and xenon)-saturated cold storage solutions reduce ischemia-reperfusion injury in a rat model of renal transplantation. Nephron Extra 2011;1:272-82. Martens A, Montoli M, Faggi G, Katz I, Pype J, Vanaudenaerde BM, et al. Argon and xenon ventilation during prolonged ex vivo lung perfusion. J Surg Res 2016;201:44-52. Faure A, Bruzzese L, Steinberg JG, Jammes Y, Torrents J, Berdah SV, et al. Effectiveness of pure argon for renal transplant preservation in a preclinical pig model of heterotopic autotransplantation. J Transl Med 2016;14:40. Brücken A, Bleilevens C, Föhr P, Nolte K, Rossaint R, Marx G, et al. Influence of argon on temperature modulation and neurological outcome in hypothermia treated rats following cardiac arrest. Resuscitation 2017;117:32-9. Eisenhauer DM, Saunders CJ, Ho HS, Wolfe BM. Hemodynamic effects of argon pneumoperitoneum. Surg Endosc 1994;8:315-20. Mann C, Boccara G, Grevy V, Navarro F, Fabre JM, Colson P, et al. Argon pneumoperitoneum is more dangerous than CO2 pneumoperitoneum during venous gas embolism. Anesth Analg 1997;85:1367-71. Martens A, Ordies S, Vanaudenaerde BM, Verleden SE, Vos R, Verleden GM, et al. Aporcine ex vivo lung perfusion model with maximal argon exposure to attenuate ischemia-reperfusion injury. Med Gas Res 2017;7:28-36. Ulmer TF, Fragoulis A, Dohmeier H, Kroh A, Andert A, Stoppe C, et al. Argon delays initiation of liver regeneration after partial hepatectomy in rats. Eur Surg Res 2017;58:204-15. Smith SF, Adams T, Hosgood SA, Nicholson ML. The administration of argon during ex vivo normothermic perfusion in an experimental model of kidney ischemia-reperfusion injury. J Surg Res 2017;218:202-8. Fowler B, Ackles KN. Narcotic effects in man of breathing 80-20 argon-oxygen and air under hyperbaric conditions. Aerosp Med 1972;43:1219-24. Fumagalli F, Scala S, Affatato R, De Maglie M, Zani D, Novelli D, et al. A1107 Post-resuscitation treatment with inhaled argon improves outcome even after a prolonged untreated cardiac arrest in a porcine model. Intensive Care Med Exp 2016;4 Suppl 1:A1107. Black AM, Hahn CE, Maynard P, Scott IL. Measurement of lung volume by multiple indicator dilution. Differences in apparent volumes of distribution of oxygen, nitrogen and argon. Br J Anaesth 1984;56:289-98. Ozanne GM, Zinn SE, Fairley HB. Measurement of functional residual capacity during mechanical ventilation by simultaneous exchange of two insoluble gases. Anesthesiology 1981;54:413-7. McCarthy DS, Spencer R, Greene R, Milic-Emili J. Measurement of “closing volume” as a simple and sensitive test for early detection of small airway disease. Am J Med 1972;52:747-53. Heneghan CP, Branthwaite MA. Non-invasive measurement of cardiac output during anaesthesia. An evaluation of the soluble gas uptake method. Br J Anaesth 1981;53:351-5. Bonde-Petersen F, Norsk P, Suzuki Y. A comparison between Freon and acetylene rebreathing for measuring cardiac output. Aviat Space Environ Med 1980;51:1214-21. Kotzerke J, Glatting G, van den Hoff J, Höher M, Neumaier B, Wöhrle J, et al. Validation of myocardial blood flow estimation with nitrogen-13 ammonia PET by the argon inert gas technique in humans. Eur J Nucl Med 2001;28:340-5. Pavlov BN, Buravkov SV, Soldatov PE, Vdovin AV, Deviatova NV. The Effects of Oxygen-Argon Gaseous Mixtures on Humans under Long-Term Hyperbaric Condition. In: Berlin LH, editor. Advances in High Pressure Bioscience and Biotechnology: Proceedings of the International Conference on High Pressure Bioscience and Biotechnology, Heidelberg, August 30 – September 3, 1998. Heidelberg: Springer Berlin Heidelberg; 1999. p. 561-4. Horrigan DJ, Wells CH, Guest MM, Hart GB, Goodpasture JE. Tissue gas and blood analyses of human subjects breathing 80% argon and 20% oxygen. Aviat Space Environ Med 1979;50:357-62. Mielck F, Stephan H, Weyland A, Sonntag H. Effects of one minimum alveolar anesthetic concentration sevoflurane on cerebral metabolism, blood flow, and CO2 reactivity in cardiac patients. Anesth Analg 1999;89:364-9. Grüne F, Kazmaier S, Hoeks SE, Stolker RJ, Coburn M, Weyland A, et al. Argon does not affect cerebral circulation or metabolism in male humans. PLoS One 2017;12:e0171962.